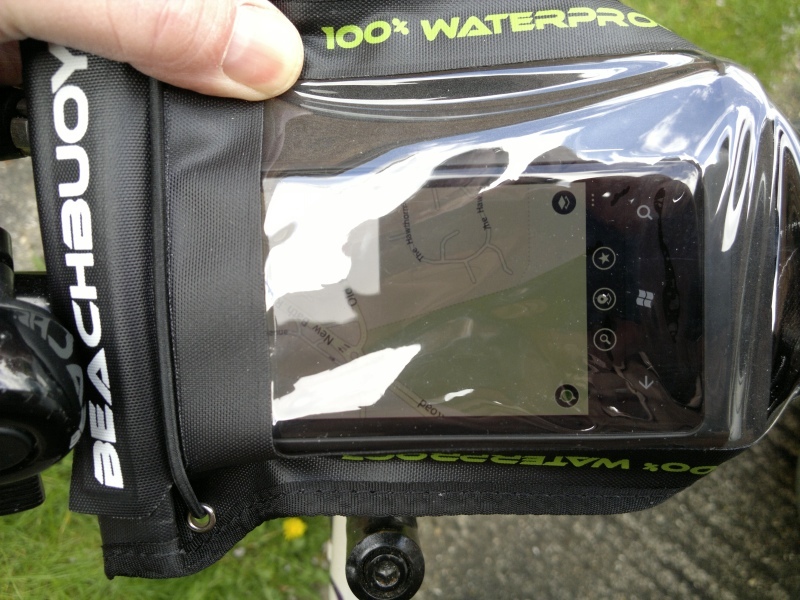 As reported last week, Proporta's just launched a bike mounted version of their popular Beach Buoy waterproof case for all touchscreen phones - and I couldn't resist giving it a real world test. 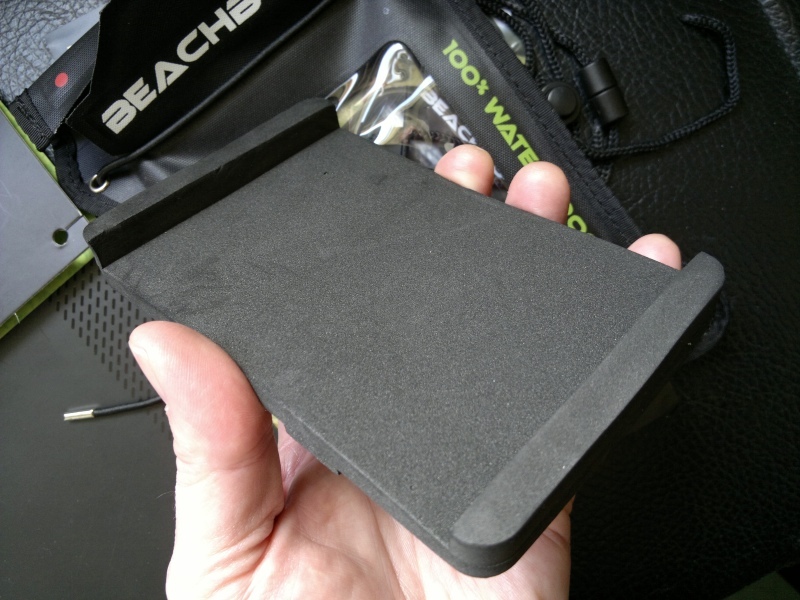 Here's my review - is it worth the five minutes set up time to have your smartphone always to hand in all weathers? Maybe - I'd say a more definite yes, if you live in the rainy UK and get lost a lot! The case may look familiar - it's a slightly repackaged version of the original, reviewed here. 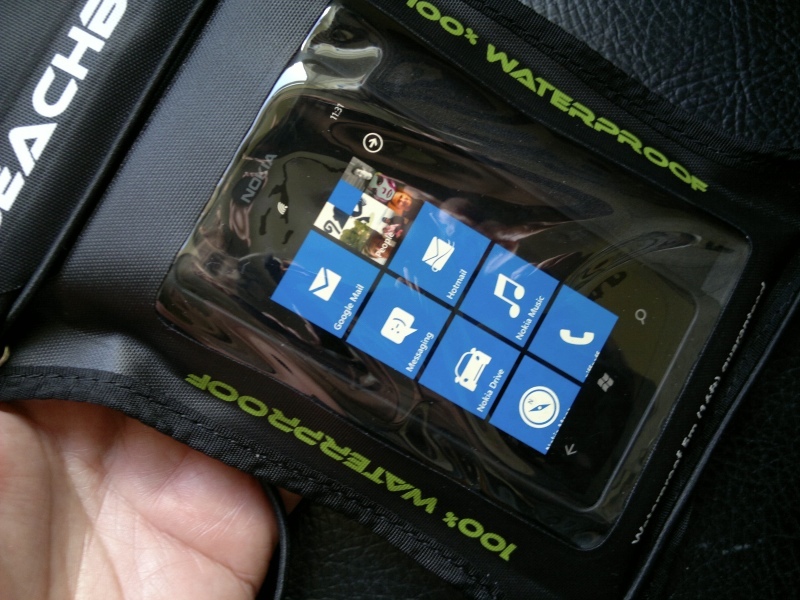 Essentially, the core pouch is a tough plastic, waterproof case, with transparent front and back windows that work surprisingly well with capacitive touchscreens. 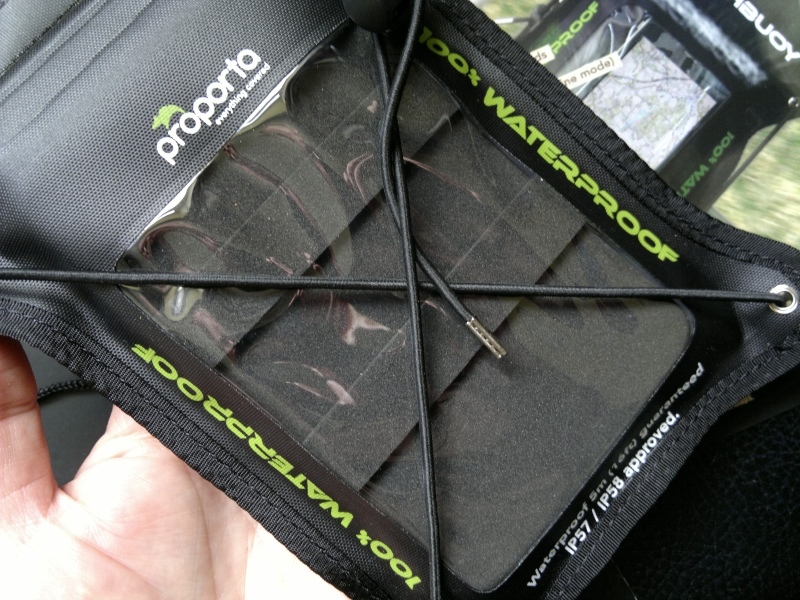 The waterproofing is achieved through a double 'click seal' and a velcro roll-up system and works well, I've demonstrated the system keeping my smartphone safe underwater before. a voucher from ViewRanger for £7.50 worth of map credit (this is an off-road OS map system that Rafe and I think very highly of, and which works especially well with the concept of biking with smartphone screen in view/accessible) - if you were thinking of using ViewRanger anyway then you'd have probably bought your local map tile too, bringing the case price down to £10 or so. Here's the insert/tray, sized to take anything up to Samsung Galaxy S II form factor. My Nokia E7 is the biggest from the Symbian world and this fitted fine. From the Windows Phone world, the Lumia 900 and HTC Titan models are (in theory) too big, but a determined owner will just snip off the top lip and use the tray anyway. And so to trying the system out for real, in this case using my Nokia N8 to take the photos and my Lumia 800 to be the in-situ guinea pig. 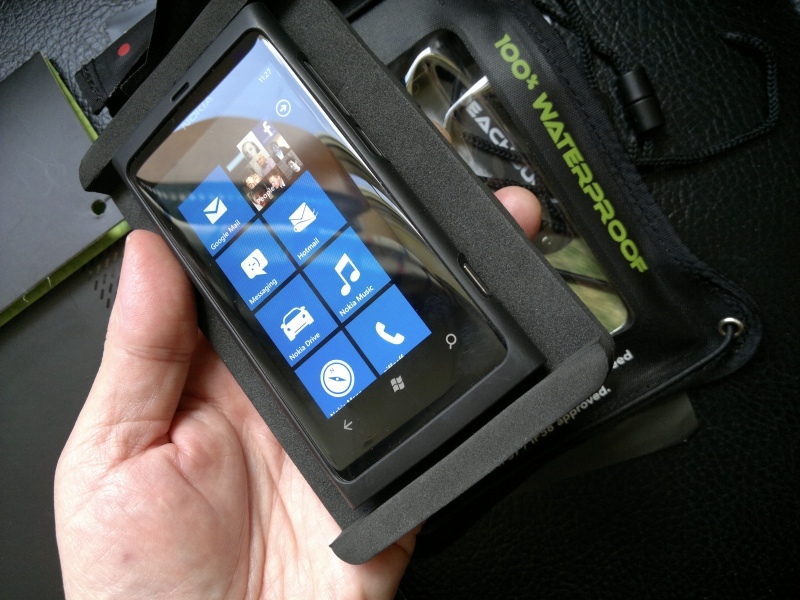 Note that the Lumia itself was already sheathed in the supplied rubber slip case - after all, you can never have too much shock protection when crashing around hillsides! Fitting the arrangement onto bike handlebars is a little fiddly. You slacken off the cord tension, then slide one handlebar through two of the diagonal cord arms, then you stretch the remaining two and slide these over the other handlebar. Arrange the phone/case in position and then pull the cord as tight as possible - it slides neatly through all the eyelets to make this easy enough. 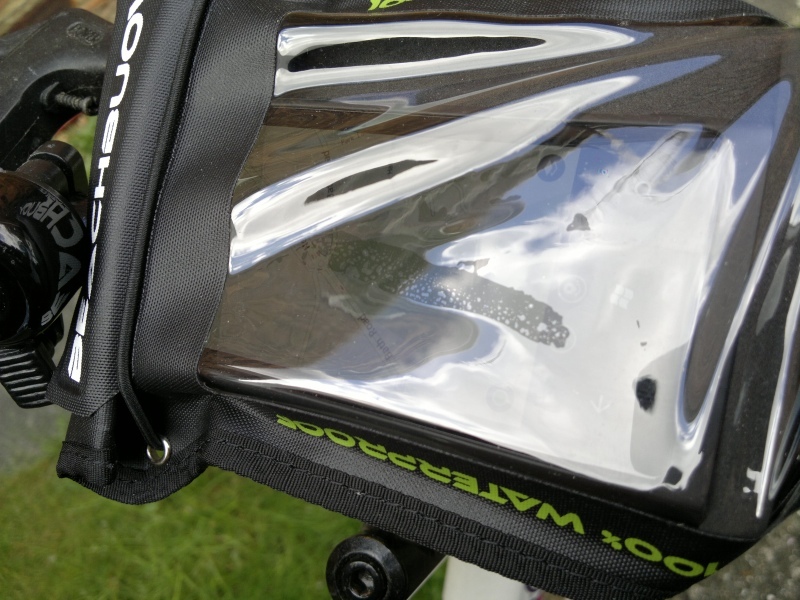 When the case feels as though it's not going to move around when riding, the tension adjuster is slid up to keep the cord at the current length. The whole process, from picking up your phone, inserting it into the tray, inserting the tray, doing up the seals, positioning the case on the bike and adjusting cord tension, takes around five minutes, not a showstopper, but also not something you're going to want to do half a dozen times each day. One oddity is that because the eyelets are positioned asymmetrically around the transparent window/phone tray, once the cord is tightnened, the phone/tray are forced up slightly towards the top of the case, as shown below. On my 3.7"-screened Lumia 800 here, I lost access to the top of the display - on a 4" screened phone this might be a showstopper, depending on what you wanted to do while riding. In position though, the arrangement did work quite well, I was able to cycle ('drive') along and get full sat-nav guidance. With a mapping package like ViewRanger (not available yet on Windows Phone, but available for years on Symbian, should I fancy taking my N8 for a spin! ), this would work even better off-road. Most software packages on most phones support landscape mode, which is why I mounted my BeachBuoy in this form (ignore the Nokia Maps for Windows Phone shown above, it's one of the few that doesn't - yet), but there's no reason why the BeachBuoy Bike Mount couldn't be positioned in portrait mode if needed. The whole mounting system is delightfully low tech - hopefully meaning there's not much to go wrong, though every handlebar set is different in terms of geometry, cables and protrusions, so your mileage will (literally) vary! But let's end on a high note - the BeachBuoy Bike Mount did as it claimed, it mounted each of the smartphones I tried on my bike handlebars securely and in totally waterproof fashion. Either riding along or stopping to check something, the phones could largely be used in situ without issue. 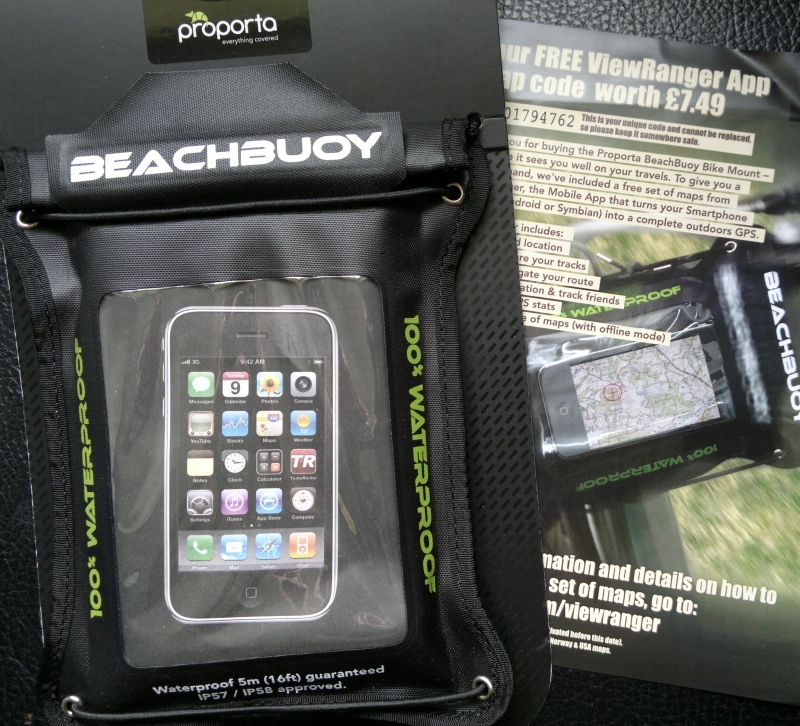 Whether visibility, whole screen accessibility or set up time is a problem to you is something that can probably only be assessed once you've bought one and tried it for size - thankfully the accessory doesn't cost the earth, especially if you were planning on buying one or more ViewRanger off-road maps anyway. Recommended if you're an outdoor type!